The University of Ghana Business School has welcomed a new accountant, Mrs. Eunice Esther Mensshan, on 1st August, 2018 in accordance with the University’s financial administration. With respect to her passions, Mrs. Eunice Esther Mensshan explains that, putting all standards into place, she will work within the policies and the guidance of the University in order for the School to move in the right direction. She further said that she will ensure smooth performance of her duties. The University of Ghana Business School (UGBS) organised a Public lecture on Monday, 24th September, 2018 at the Graduate Building with Professor Victor Murinde of SOAS University of London, on the topic: "Financial Technologies Paving a Bright New Path for the World’s Unbanked Population". The lecture was themed: “Illicit Financial Flows out of Africa: Driving Financing of Public Infrastructure in the Global South”. 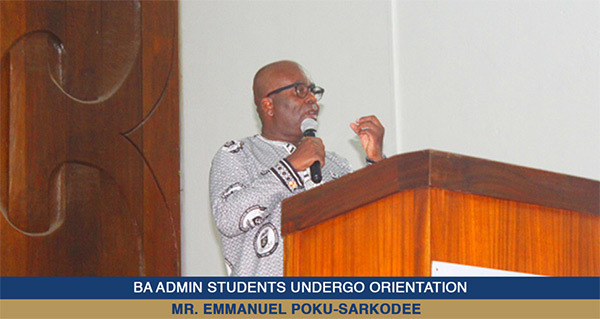 The University of Ghana Business School and the Mentoring and Student Services Unit on Friday 28th September, 2018 organised an orientation session for newly admitted students into the BA Admin Programme on the topic “The Structure of BA Administration Programme”, at the R. S Amegashie Auditorium. 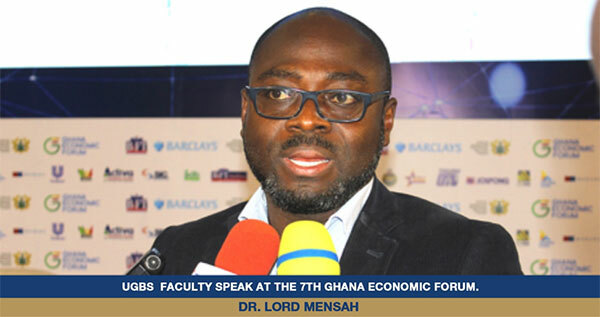 Dr. Lord Mensah and Dr. Kobby Mensah, senior lecturers of the University of Ghana Business School participated in a two-day Ghana Economic Forum (GEF) held at the Movenpick Ambassador Hotel, Accra on 4th and 5th September, 2018 on the theme, “Building a Competitive Economy for Sustainable Growth”. The University of Ghana Business School (UGBS) in partnership with Springfield E&P Group on 23rd August, 2018, organised a Nation-Building Entrepreneurial Fora on the theme “Unearthing and Enhancing the Innate Potential of Ghanaian Youth for Business Creation and National Development”. Present at the event were the Head of the Department of Marketing & Entrepreneurship, Professor Robert Hinson, the School’s Administrator, Mr. Emmanuel Poku-Sarkodee and keynote speaker, Mr. Kevin Okyere, CEO of the Springfield Group.